Poolscapes has a complete line of pool accessories for your new or existing in-ground swimming pool. You can add some fun for the kids with a Basketball or Volleyball Set. We even have custom built Fireplaces and fire pits available too. Since the design is only limited by your imagination, the styles are unlimited. You can have either Natural Gas, LP or wood burning ones. You can add a volleyball set to your new or existing ingournd pool. Everyone will have fun playing water volleyball in your swimming pool. Ask Poolscapes about adding one to your pool today. Poolscapes can pre-install deck anchors for future add-ons like a basketball goal or your volleyball net. Contact Poolscapes about adding one to your existing pool today. 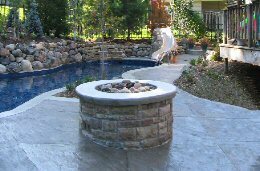 Poolscapes will help you design the perfect custom built fireplace or fire pit for your inground pool. Why buy a cheap fire pit from the store when Poolscapes can build it to suit your needs.